Anarchy makes it easy for terrorists to set up shop. Yet the international community has been reluctant to commit the necessary resources to peacekeeping-with devastating results locally and around the globe. 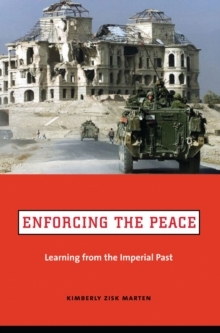 This daring new work argues that modern peacekeeping operations and military occupations bear a surprising resemblance to the imperialism practiced by liberal states a century ago. Motivated by a similar combination of self-interested and humanitarian goals, liberal democracies in both eras have wanted to maintain a presence on foreign territory in order to make themselves more secure, while sharing the benefits of their own cultures and societies. Yet both forms of intervention have inevitably been undercut by weak political will, inconsistent policy choices, and their status as a low priority on the agenda of military organizations. In more recent times, these problems are compounded by the need for multilateral cooperation-something even NATO finds difficult to achieve but is now necessary for legitimacy. Drawing lessons from this provocative comparison, Kimberly Zisk Marten argues that the West's attempts to remake foreign societies in their own image-even with the best of intentions-invariably fail. Focusing on operations in Haiti, Bosnia, Kosovo, and East Timor in the mid- to late 1990s, while touching on both post-war Afghanistan and the occupation of Iraq, Enforcing the Peace compares these cases to the colonial activities of Great Britain, France, and the United States at the turn of the twentieth century. 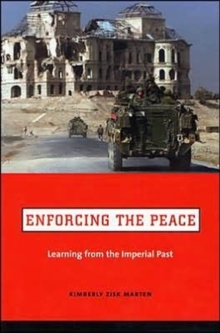 The book weaves together examples from these cases, using interviews Marten conducted with military officers and other peacekeeping officials at the UN, NATO, and elsewhere. Rather than trying to control political developments abroad, Marten proposes, a more sensible goal of foreign intervention is to restore basic security to unstable regions threatened by anarchy. The colonial experience shows that military organizations police effectively if political leaders prioritize the task, and the time has come to raise the importance of peacekeeping on the international agenda.